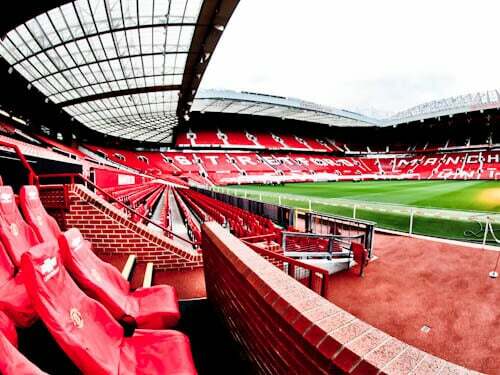 Due to the popularity of Manchester United, I recommend you book the Old Trafford stadium tour online in advance. 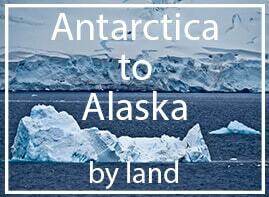 Moreover, if you’re looking for something extra special, consider a Legends Tour. You can choose a hotel in Manchester City Center and take a tram to the stadium. Alternatively, there are several hotels close to the stadium. Old Trafford is in southwestern Manchester, adjacent to Salford Quays and Old Trafford cricket ground. You can take the tram from central Manchester to Old Trafford station. From there, it’s a short walk past the cricket ground and along Sir Matt Busby Way to the stadium. Alternatively, I recommend the Media City stop if you also plan to visit Media City UK. In front of the East Stand are 2 important statues. Firsty, is the statue of Sir Matt Busby who is arguably the greatest ever Manchester United manager. 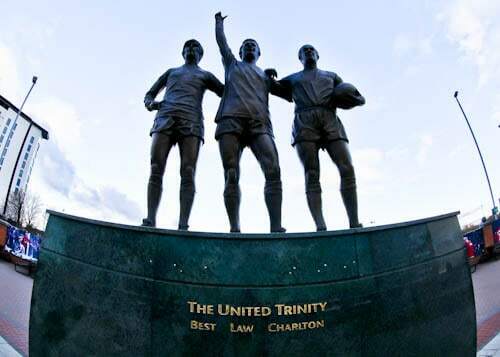 Opposite Sir Matt Busby statue is the United Trinity statue. This features 3 Man United legends, George Best, Denis Law and Sir Bobby Charlton. Sir Bobby Charlton was one of the survivors of the Munich Air Disaster. All 3 of these went on to win the European Cup in 1968 with Manchester United. For this reason, Manchester United was the first English team to win the European Cup. Did you know the first British team to win the European Cup was Celtic in 1967. On 6th February the Manchester United team were returning home from Belgrade. As a matter of fact, they had just qualified for the European Cup semi final. The plane landed in Munich to refuel. Due to severe weather the plane crashed on take off. As a result, 23 of the 46 on board lost their lives including several first team players. Manager Sir Matt Busby was onboard and survived. He went on to rebuild the team and Manchester United won the European Cup 10 years later in 1968. Finally, did you know there is also a Berlin Air Disaster memorial in the Red Star Belgrade Museum in Serbia? Sir Alex Ferguson is one of the most successful and respected managers worldwide. He retired in 2013 after 26 years in charge of Man United. During this period he won 13 Premier Leagues and 2 Champions Leagues. As a matter of fact he won a total of 38 trophies during his Manchester United reign. Not a lot of people remember this but Sir Alex Ferguson also took Scotland to the World Cup Finals in 1986. 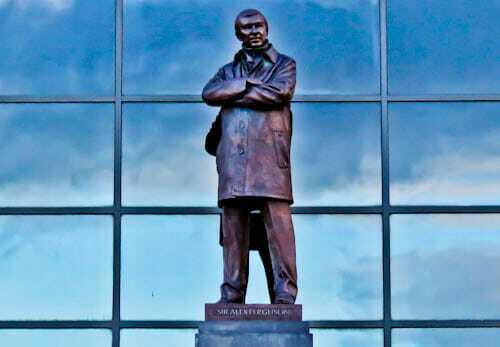 You can see his statue outside the Sir Alex Ferguson stand which holds over 26,000 spectators. The stadium tour starts from inside the Sir Alex Ferguson stand. When you take the stadium tour you also have access to the Manchester United Museum. Some of the historic turnstiles from 1910 are on display in the museum. In fact, there are still some in use throughout the stadium which work perfectly despite being over 100 years old. 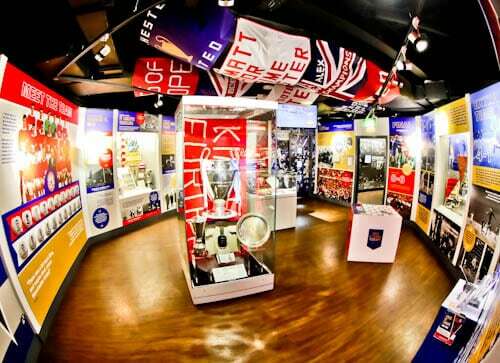 As you would imagine, a football club with as much history as Manchester United has a huge museum. In addition, the Manchester United trophy room is huge. The museum takes you from the formation of the club, through the war years and up to the present day. 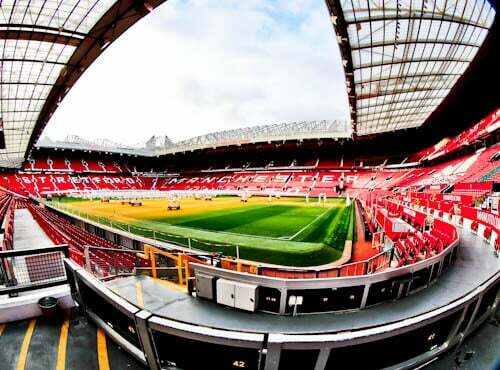 Old Trafford is the largest club stadium in the United Kingdom. It’s also the 3rd largest stadium in the UK after Wembley and Twickenham. The capacity is 74,994 spectators and it sells out regularly. 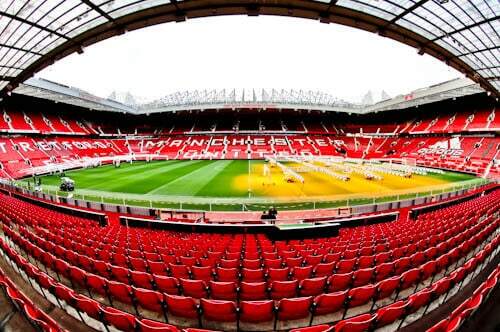 It’s often referred to as the Theatre of Dreams which was definitely true throughout the Sir Alex Ferguson era. 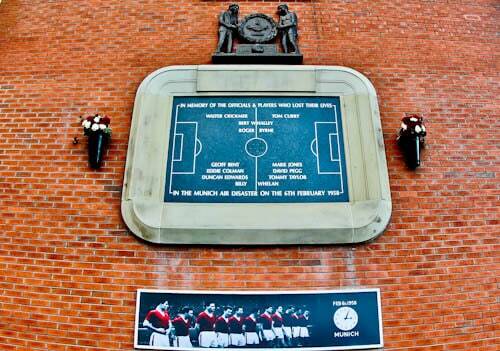 The nickname, Theatre of Dreams was created by Busby Babe, Sir Bobby Charlton. 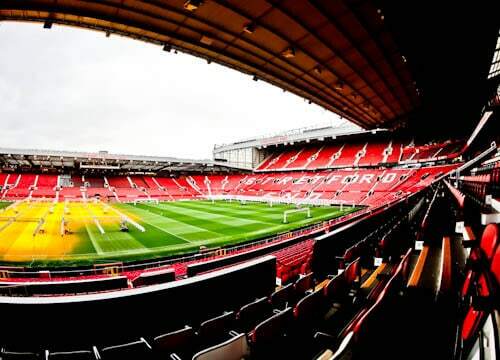 Lastly, Old Trafford was a 1966 World Cup stadium and hosted Portugal, Bulgaria and Hungary in Group 3. Imagine the greats who have enjoyed a game from the VIP section. Prince Harry, Sir Alex Ferguson and David Beckham have all enjoyed a match from which are arguably the best seats in the house. Furthermore, you could stretch it and add Victoria Beckham to the list! 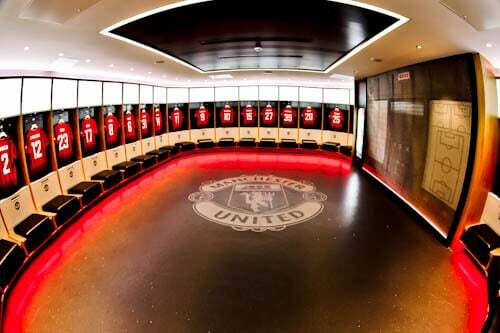 Unfortunately, the away team dressing rooms are not part of the Old Trafford stadium tour. Due to the fact this is a 5 star venue I expect them to be of excellent quality. Unlike the away team dressing rooms at St James’ Park, home of northern rivals Newcastle United. I visited Old Trafford towards the end of the Jose Mourinho reign. Although he had an unsuccessful reign at the club, he was highly influential in the design of the home team dressing room. As well as featuring the homely Manchester United logo it also features state of the art analysis equipment. Lastly, you’re welcome to take a photo next to your favorite players shirt. 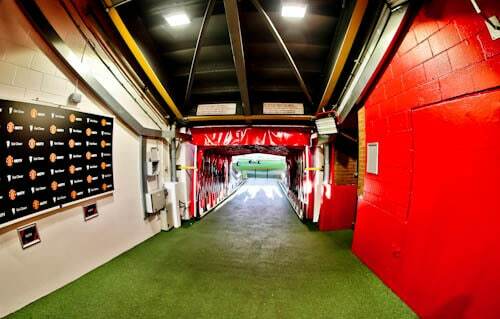 You will enter the Old Trafford stadium through the famous players tunnel. The guide will play the entrance music which is ‘This is the one’ by Stone Roses. It became the entrance music in 2000 after a request by Gary Neville. Although the song has nothing to do with football, Stone Roses are a Manchester band. 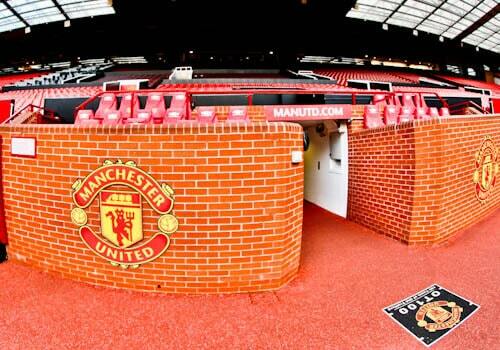 One of the most identifiable parts of Old Trafford are the dugouts. You’re welcome to sit and take photos from both the home as well as the away end. Do you remember the infamous moment when Arsene Wenger was sent into the crowd for kicking a bottle? You’re welcome to stand there and recreate the moment! In between the dugouts is the Old Trafford time capsule. It was created in 2010 to celebrate the 100th birthday of the stadium. An interesting fact is that relatives of Archibald Leitch helped bury the time capsule. Archibald Leitch was in fact the original architect of Old Trafford. 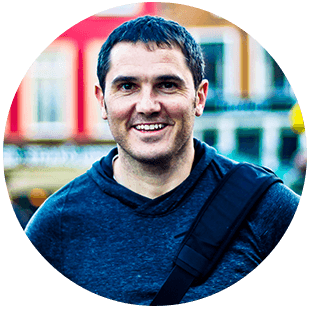 He also designed other famous stadiums in the UK including Anfield, Ibrox and Hillsborough. 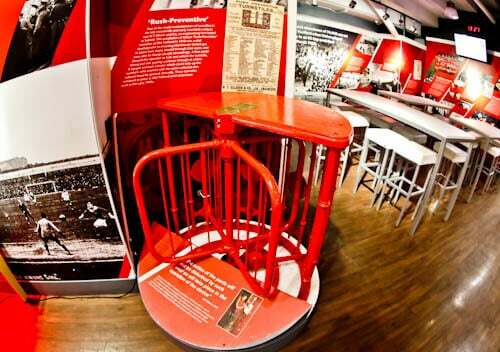 Did you know there’s also a time capsule at the Emirates Stadium? What Remains at Old Trafford from the World War II Bombings? Old Trafford was bombed in 1941 by the Germans. Not only Old Trafford but the whole city of Manchester was heavily bombed in what became known as the Manchester Blitz. As a matter of fact, Old Trafford was almost completely destroyed and became abandoned until 1949. What remains of the original stadium built in 1910? The narrow tunnel between the dugouts is all which remains from the original stadium. The current Manchester United manager will talk to the press after the match. You’re welcome to sit in the iconic Manchester United press room and pose for photos. 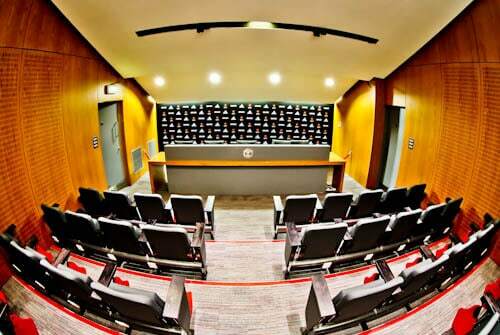 You may remember Jose Mourinho made many infamous speeches from this room! 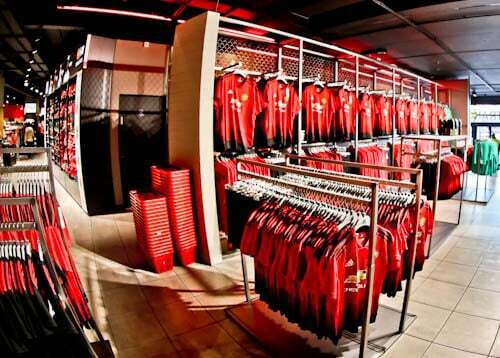 Once the tour has finished you can explore the huge Manchester United Club Shop. Here you can find virtually anything you can imagine stamped with a Manchester United logo. 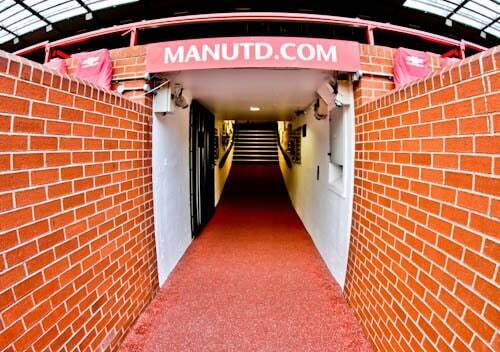 Enjoy your visit to the Theatre of Dreams, Old Trafford. 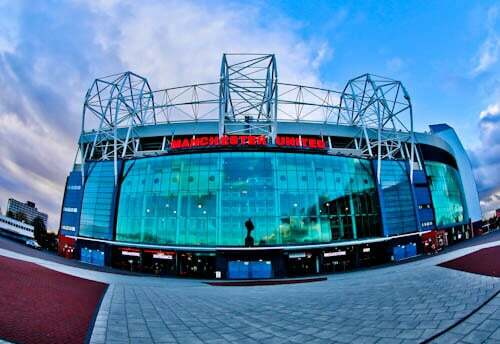 Whether you’re a football fan or not, it’s a iconic place to visit in Manchester. Why not visit city rivals, Manchester City?